While perusing through some images stored on my wife's digital camera, I came across a picture she took of me. Up to this point, I had been unable to fulfill an urge to stand under an olive tree and pick a ripe olive. 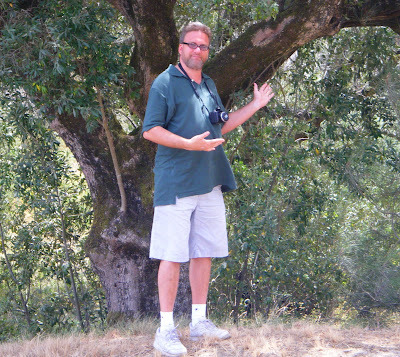 In fact, prior to finding an old, neglected olive grove on the road to Sintra, Portugal, I had been unable to find even a single olive tree. Unfortunately, this was not the time of year to pick olives, and guess what: they do not grow with those red pimento dealios in the middle.